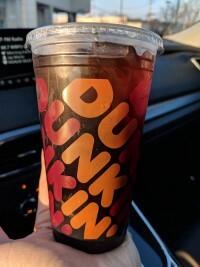 Thanks again, The Impulse Buy for making me wake up early to go to Dunkin' Donuts and get this. Both a sarcastic thanks and a non-sarcastic thanks. I saw the post and determined that I had to go. Sometimes even I fall for this stuff. I go, I buy, I sit in my car with my "lightly buttered" bagel dripping in butter and I take a sip. 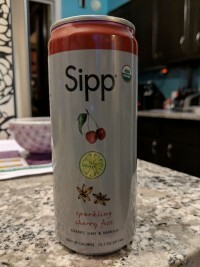 A very important note to be made is that this is sweetened by its syrup so if you would like to eat solid foods into your golden years, do not think that it's going to come unsweetened and that you should get sugar when they ask. They didn't tell me, I rolled the dice, I won this round. I rarely win. I won. It was good. 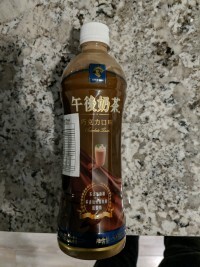 It was very sweet but the more you drank, the better it got. You're not supposed to drink coffee so fast but when it's chocolate cherry cold brew, is it ever coffee anymore? I'm no purist but the percentage of coffee remaining is so low in the mix that it's more of a "coffee flavored drink" than a full fledged coffee. Do I care? Nope-ahh. I don't give a rip. It's good. I'd drink it again right now if I woke up a little bit earlier and could go "the long way" and pick one up. I'll most certainly get one this weekend. I might also advise that you get "light" syrup, though. As I said, it was missing a lot of the coffee taste I expect from, you know, coffee. I think they do it in "pumps" there so if you order a medium, as I do, they give you three pumps of flavoring. Half the time when I ask for "light syrup" they just smile with a glint of terror in their eyes as they pump more than the recommended dose. Other times it's fine. Rolling the dice every day of my life. So it's tied for second. Great. It's good. It says that it's black"bury" and cham"pain" because it's the Black version. There is also a Red version but I do not know the flavor of that one yet. I have it at home and hope to review it soon. I don't know how accurate it is. I have recently eaten blackberries as of this week and I guess I can accept that is what it tastes like. I haven't had champagne since 1996 so I cannot tell you what that tastes like. I can tell you for truth that this tastes good, though. Nice, bold and fruity. A nice pick-me-up for the top of the morning. Find it while you can as these won't be here much longer. I assume they are leftover from Valentines' Day and since that was a month and a half ago, they, as well as us, are living on borrowed time. I'll have the 2-2-2, please? Egg? Ugg, scrambled. Sausage. Pancakes please. Oh, chocolate chip pancakes. Oh, to drink? Umm. You know what? I'll have a coffee and an orange juice. Thank you. Wow. That was fast. Oh, it's made before hand and microwaved and brought to me? You can hardly taste the difference. If I wasn't such a scumbag, I might complain but it's garbage food to begin with so I'm fine with it. Why...why are you making that face? Oh yeah, I like to pour orange juice into my coffee. It cools it down and gives it a citrus taste. 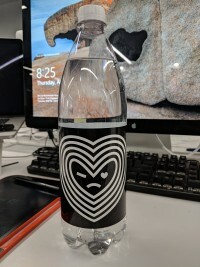 Is it good? Well it's not...poison. I don't know why I do it. I've been doing it seemingly forever. Wait wuuuuuuuuuuuuuuuuuuuuuuut? You have a drink that tastes like orange juice and coffee mixed together? You can save me the painstakingly large amount of drinking half my orange juice straight like a savage and then pouring scalding hot coffee into my orange juice cup? How it is? It tastes exactly the same? 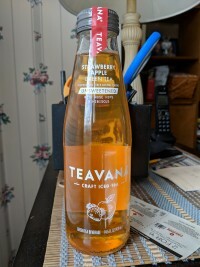 Does it have the same, strange orange citrus taste mixed with the strange bitterness of coffee? You don't say. Well Darlene, I will take one to go and I will tip you handsomely. No, I'm not calling you handsome. Well I did notice that you have a moustache and while it looks good on you I wasn't going to say anything about it. Well I didn't know if you were going for something and I thought it to be none of my business. Darlene, take this $5. It's yours. Cash. Take it. 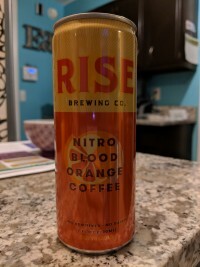 I'll take this can of Rise Nitro Blood Orange Coffee and drink it in the car on the way to clown college. Yes Darlene, you heard me correctly. I'm a grown man going to clown college. My life isn't going exactly as planned.